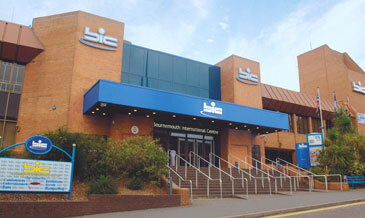 The Bournemouth International Centre (BIC) and the Pavilion Theatre and Ballroom are venues for a wide range of functions, events, conferences and shows. The centre hosts everything from large rock and pop concerts to multi-hall conferences and smaller more intimate meetings to exhibitions, opera, ballet and comedy performance. • The Windsor Hall is the impressive main auditorium and the showpiece of the venue. • The Tregonwell Hall is ideal if you are organising a product launch, entertainment or a social event. • The Purbeck Hall is perfectly suited for exhibitions, conferences or social events, including sporting dinners, public ice skating, fashion shows and gala banquets; with its own integral bar. • The Solent Hall is flexible enough to be configured for staged shows and presentations, exhibition, conferences or banquets. If you are exhibiting at BIC, have you sourced your exhibition display equipment and marketing materials yet? POD supply a huge range of portable display products including pop up kits, banner stands and modular display stands, with an in house design studio and printing facilities to look after all your quality graphics.